Optical crystal globe awards on a sloping plaque. These striking contemporary awards stand 7in tall and are ideal as recognition or achievement awards for a wide range of events and achievements. These stunning crystal globe awards are fitting rewards for the very highest levels of achievement. Crafted in 2in thick flawless optical crystal, they feature a clear plaque with stylish rounded corners and striking diagonal slope at the top, into which is set a finely detailed optical crystal globe. The flat front of these awards is suitable for engraving or colour printing, for instance with event details, organiser or sponsor logos, and winner details. 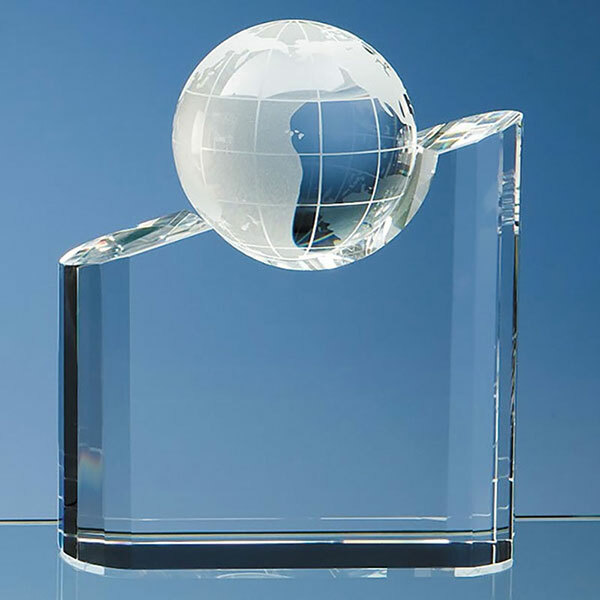 We offer low, fixed cost laser etched engraving of text and free laser etched engraving of logos, and/or colour print options, so you can customise these crystal globe awards to create unique trophies and presentation items. Each award is supplied in a black foam-lined presentation box. Award weight: 2.9kg. Height: 180mm. Width: 150mm.